The dissolution of the Austro-Hungarian Empire at the close of World War I allowed the Slovaks to join the closely related Czechs to form Czechoslovakia. Following the chaos of World War II, Czechoslovakia became a Communist nation within Soviet-dominated Eastern Europe. Soviet influence collapsed in 1989 and Czechoslovakia once more became free. The Slovaks and the Czechs agreed to separate peacefully on 1 January 1993. Slovakia joined both NATO and the EU in the spring of 2004 and the euro area on 1 January 2009. Diameter = Approximate Diameter in millimetres. Alloy = Fineness of gold. AGW = Actual fine gold weight in troy ounces. For silver and base metal coins of Slovakia, please look at our original Chard Coins website. 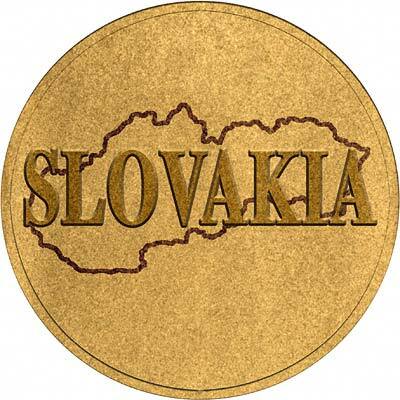 We make an active market in almost all world coins, gold or otherwise, including Slovakian gold coins. If you have any of these coins to sell, please contact us, or post them to us for appraisal and offer.